Harder, better, faster, stronger. Has the GTX 580 just graduated? Nvidia's GTX 580 is a highly desirable card. AMD doesn't have a card to rival it. The HD 6970 is decent but doesn't compete directly. And the dual Antilles-powered HD 6990 overshoots the price mark at £540. What's more, the GTX 580 is more power efficient. It's the optimum Fermi card, and a solid foundation for third parties to muck around with. 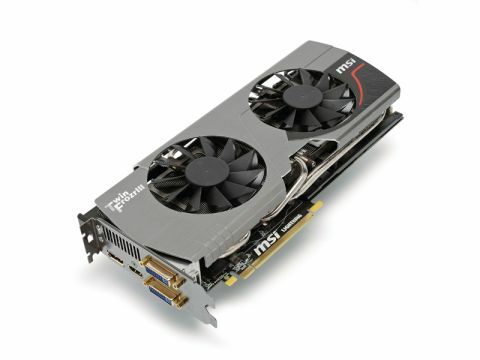 MSI is good at keeping graphics cards cool, as it has demonstrated with its Twin Frozr cards. It's also rather good at overclocking: the Afterburner software is an office favourite. And the GTX 560 Ti Twin Frozr II pushed a conservatively clocked card to impressive clock speeds and resultant performance levels. The clock speeds of Nvidia's reference GTX 580 are bold, but not on the ragged edge, so the whole N580GTX Lightning package is about squeezing every bit of potential possible from an already formidable Fermi card. One aspect of that comes with the increased core, shader and memory clock values. The core's bumped around 10 per cent from 772MHz to 832MHz, and the other clocks follow suit in a similar percentage increase. It grabs an extra two to three frames in all DX11 benchmarks, from Heaven 2.5 to Metro 2033. That level of increased performance in no way justifies the step up in price from the original GTX 580, though, and MSI knows it. That's why it's given the card truckloads of overclocking potential. We got the N580GTX Lightning running without tantrums with a core clock of 920MHz, shaders at 1,840MHz and memory speed of 2,300MHz: an impressive performance. That headroom isn't just increased by the Twin Frozr III cooling fans, though they are resplendent in their scything 'propeller blade' glory. The improved blade design allows 20 per cent more airflow, and MSI reckon it's quieter than a stock fan, but at 100 per cent speed, it's not only loud but sings a particularly irritating tone. Fans are one thing, but even more focus has gone towards voltage. It supports simultaneous overvolting of the GPU, memory and PLL, massively increasing overclocking potential. A 16-phase PWM replaces the stock 8-phase controller for increased stability, and electrical components have a higher capacity across the board. This all means nothing if your motherboard and PSU aren't of a similar standard, but if you want to get your hands dirty with overvolting and have a system that can handle it, this is for you. It's a package you can really push, and when you do, the cooler keeps temps below 60 degrees. Good progress from Nvidia's original, if encroaching a little on dual-GPU price territory.